I’ve been thinking about tripods lately, or more correctly, tripod heads. I think it started last week when someone on Twitter asked me what tripods I liked. It continued this past weekend as I dialed in the drag and counterbalance settings on the ones in our auditorium. I’ve written about this before, (Improving Videos--Get a Tripod and IMAG--Solid Foundations) but I think enough time has passed to revisit the subject. Today, I want to specifically cover sizing. I’ve seen a lot of big cameras on really small tripod/heads. I’ve even occasionally seen a small camera on even smaller tripods. In fact, when I first arrived at Upper Room, the only tripod we had was barely suitable for a pocket-sized digital camera and we were trying to use it for a GL-2. Vinten Vision 11 SeriesThe problem with undersized tripods & heads is twofold. First, you will probably not have enough counterbalance in the head (assuming the small head in question) to balance the camera properly. When a camera is sized for the head, you can set the tilt drag frighteningly low, tilt to any angle and the camera should stay put. If the head is under-sized, it won’t be able to do that. Also, an undersized head will not pan or tilt smoothly because the loads the camera is placing on it are too great. Smooth pans and tilts will be difficult at best. The other problem with under-sizing the tripod is with the legs (or sticks). Lets that are too small will begin to “wind up” as you pan. When you stop panning, they will unwind and the camera will seem to pan backwards a little. You will be constantly frustrated trying to get the camera to stop in the right spot as the legs wind and unwind. It’s crazy-annoying. Thankfully, with the advent of smaller, palm-corders, under-sizing is less of a concern than it used to be. Back in the day when a full-size ENG camera and dockable recorder weighed easily 18-24 pounds, many people tried to skimp on the head and get one rated for 15 pounds The results were often very disappointing. No, today, the problem we see more commonly is over-sizing. 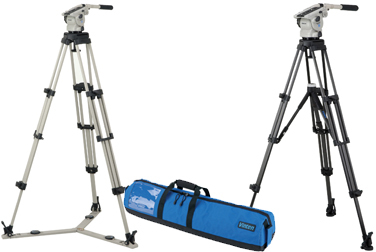 It stands to reason that a tripod/head that is rated for 18-28 pounds would work great for a camera that weighs 8. In fact, it seems a head rated for up to 40 pounds would be even better, right? Wrong. Actually, it’s worse to over-size than undersize in some regards. That’s the situation we find ourselves in right now. We have two Cartoni Master Series heads under our auditorium cameras. They are rated for a maximum payload of 66 pounds. We have cameras on them that can’t possibly weigh more than 20. The result? We can’t dial the counterbalance far enough back to keep the heads from tilting by themselves. At least not without a lot of drag. Because the heads are designed for so much weight, they don’t function properly with what amounts to no load. It’s kind of like being in a 1-ton pickup with an empty bed. Sure it will get you someplace, but the ride is pretty rough. What it all comes down to, again, is choosing the right tool for the job. The heads we have are good heads. The problem is, they’re way too big for our application. It’s so important to read the specs and match the right tool for the job. Talk to to an expert if you feel out of your depth. Don’t spend your church’s money twice.